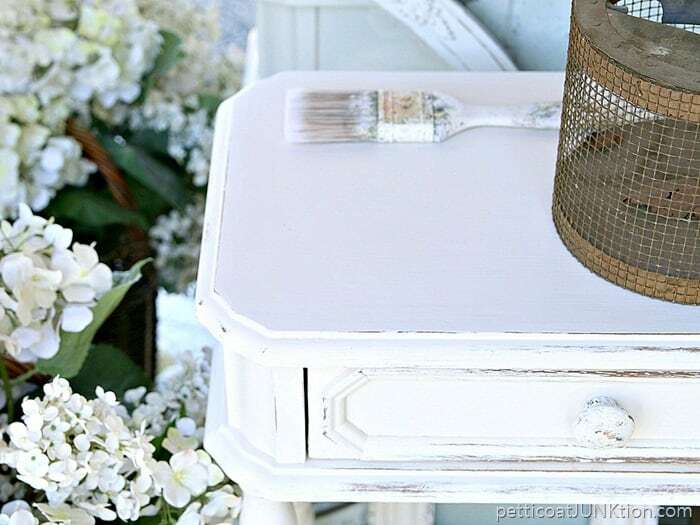 Learn how to distress white paint the easy way. 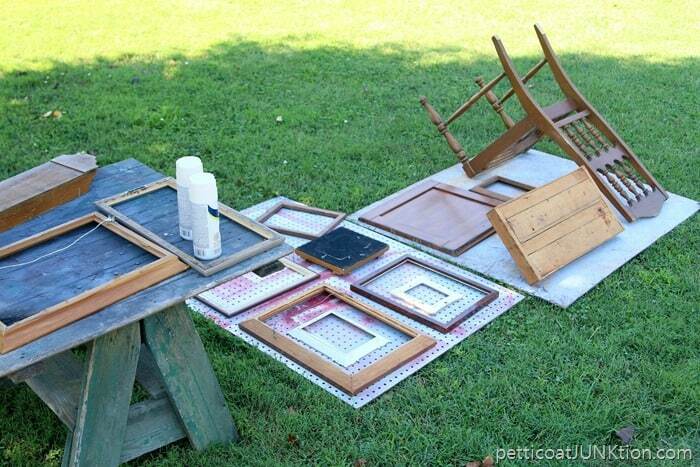 It’s easy to paint and distress several frames and other home decor accessories in one afternoon. I even made a video showing how to distress the paint. It’s short and sweet. My idea of a DIY good time is getting out the white spray paint and going to town. Throw in a little sandpaper and it’s a party. White décor is so clean and fresh looking. I love it even though my home is the total opposite, where I surround myself with color. I do have pops of white throughout the house and wanting more. I may have to rethink my decorating style. 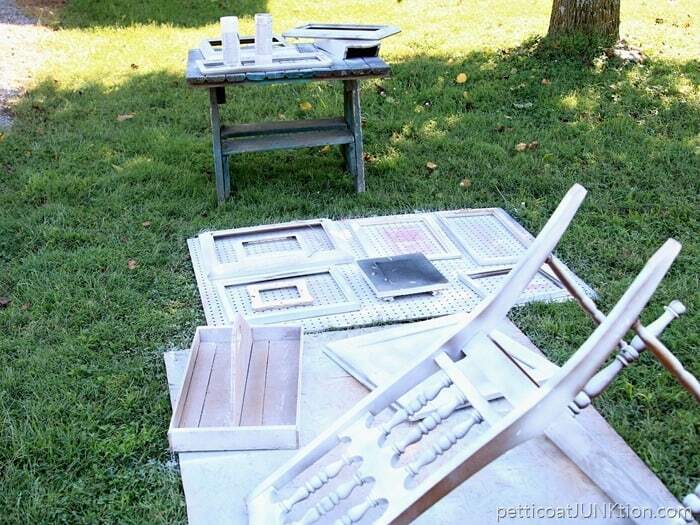 In the midst of my workshop junk stash purge I gathered a bunch of items to paint, prepped them (if needed), laid them all on tables or pegboard outdoors, and grabbed the can of white spray paint. I try to work smarter, not harder, and this is one of my time savers. Spray paint projects en masse ( fancy French term for group). I used RustOleum spray paint in Heirloom White. update: I received several questions about how much spray paint I used for the projects. What you see in the photos above took about a can and a half of spray paint. The chair just has a base coat of spray paint then I finished it by brushing on a coat of latex paint. 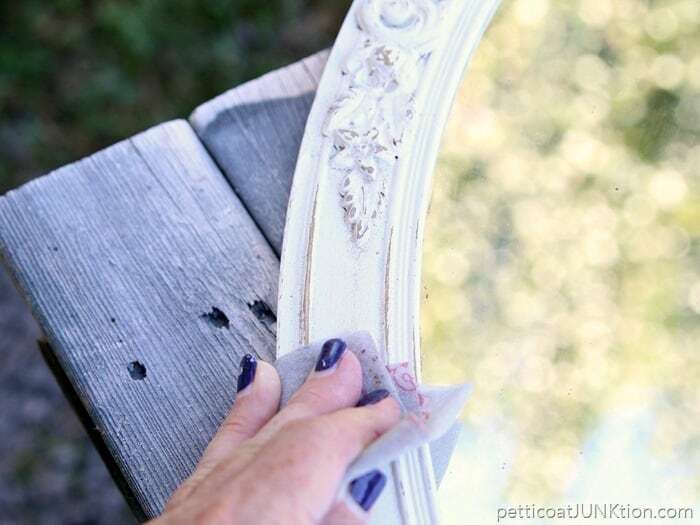 It’s hard to get into all the nooks and crannies on chairs and the spray paint a great way to take care of those areas. I distressed all of these projects by hand using 3M Flexible Sandpaper ( my new fav). The process is super easy and really fast. There is no need to try and distress all parts and edges equally. The finished project is much prettier and realistic when distressed in a random fashion. Perfectly imperfect is my go-to look. I always fold sandpaper two or three times to get a better grip on it. The regular sandpaper usually tears after just a bit of use but not the flexible kind. I counted over 15 pieces I painted in one afternoon. You guys don’t have to do everything at one time. Maybe you want to change the décor in one room. Gather a few items and either spray paint them or brush paint them at the same time. You don’t have to use white paint….go with a favorite color. 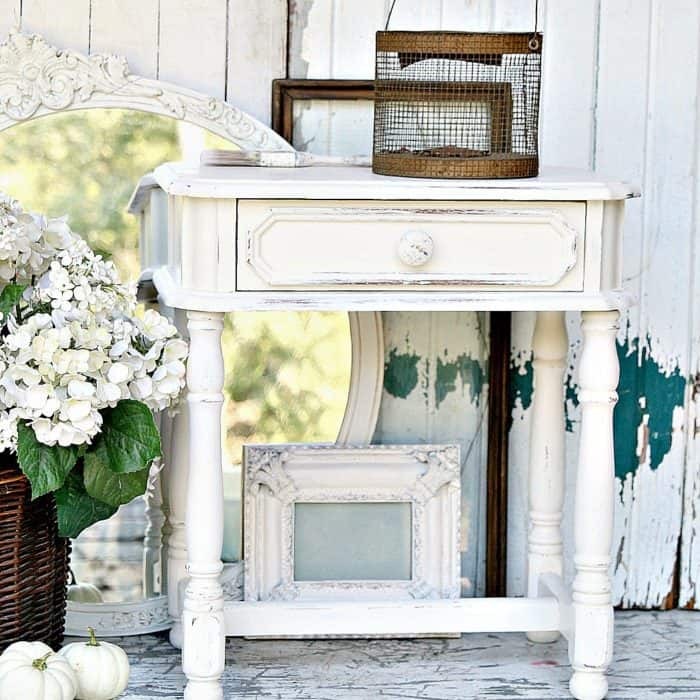 Examples of home decor to paint with spray paint: lamps, picture frames, countertop utensil holders, wood candlesticks, groups of thrift store wood or ceramic animals (owls, chickens, etc. ), silverplate trays, and more. Just a few ideas for you. You can also distress just a few pieces at a time. I do go overboard sometimes. It was a lot of fun though and I’m loving all of the white. 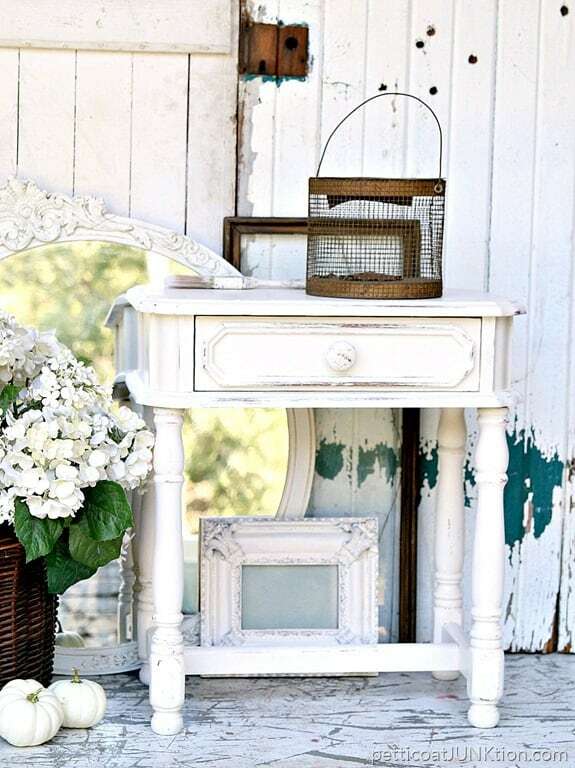 Pretty little details like those on the mirror really pop after a little distressing. 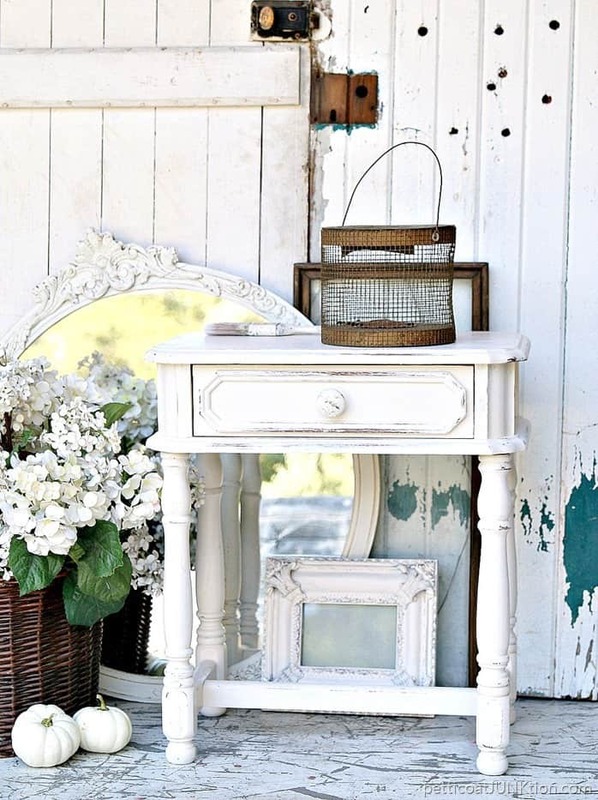 Distressing paint adds depth and character to items. And you know you can distress any color of paint, not just white. Well I got all those projects spray painted and a table or two brush painted with Reclaim paint. I made a short video (75 seconds) showing how to distress the white paint…. This is just a small part of the projects I painted that day. I ‘ll share the others in another post or two….in a week or two. (update. 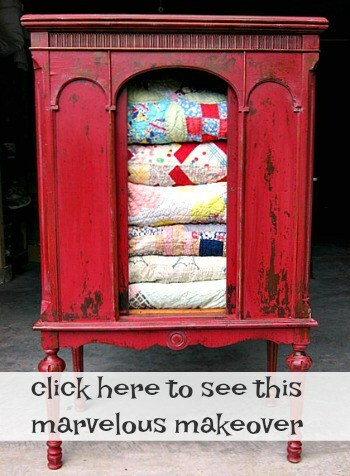 See the other projects here….Tips For Distressing Painted Furniture) . Let me know if you watched the video and if you have tried distressing paint. Some of my friends don’t like distressed paint finishes at all. That’s okay, it’s not for everyone. Kathy, what a fabulous idea! I need to do this, before winter sets in! Thanks for sharing at Dishing It & Digging It. Love it. Thank you for linking with us at #HomeMattersParty . We would love to see you again next week. Thank you for sharing this at TOHOT! This looks like how I work! 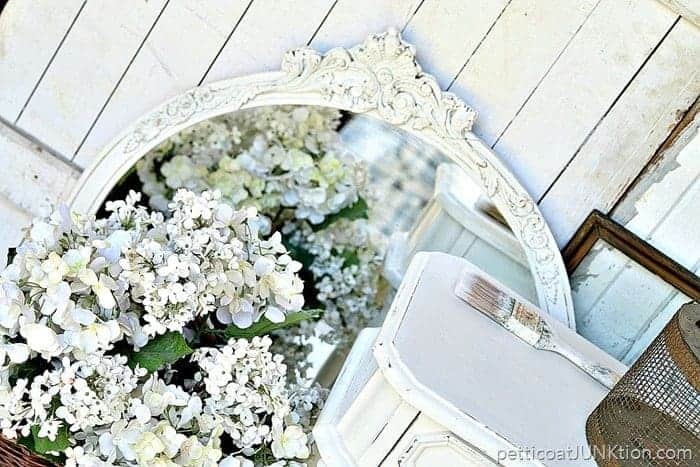 I love painting everything white too! I like distressing some pieces, then others I love in a perfect gloss with no imperfections. I guess it really goes down to what the piece is and where I plan on putting it. I like a combination of old and new. You inspire me. Thank you! 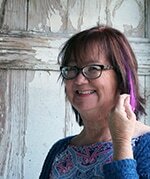 Great pieces, Kathy. I did watch the video. It was fun to see you moving at such a speed! Now I know how you get so much done all the time! Just out of curiosity how many cans of spray paint did you use to do all those pieces? I, too, think that spray paint would be a lot more expensive than brush-on from a regular paint can. Plus, environmentally, spray cans are very bad, which is always a major concern to me. I didn’t paint the table with spray paint but for all those other pieces I used less than two cans of paint. Wow! you were on a roll. I love spray paint. I recently got my granddaughter to spray paint for me because my lungs can’t take the fumes anymore. Great display with the white flowers post-painting party! I do love spray paint, but, brush on paint really costs a lot less to use on anything but the smallest projects. I acquired 2 rusty green metal plant racks – 40 inches wide, three shelves each, and ended up using 3 cans each of rust reformer and hammered silver Rustoleum spray. They look fabulous, but I should have used the brush on since I ended up spending about 40$ on the paint anyhow! OTOH, since the racks were free, I now have room for all my plants in the rec room, freeing up a guest room for actual guests! Just a casual comment, Rustoleum does go right over the rust so you really didn’t need the rust reformer…that’s the reason it is called Rust-oleum! Not sure cost of rust reformer but maybe you would have only spent half? I know the metalics, which I love by the way are more expensive then their other paints!! I didn’t know that about RustOleum! Thanks for the info.